Snap tape and hook and loop tape are easy to handle and give closures a flat, smooth finish. Snap tape allows some give on closures and is suitable for pillows that are very soft. Because closure seam allowances 3/4″ (2 cm) wide, use 5/8″ (1.5 cm) tape. 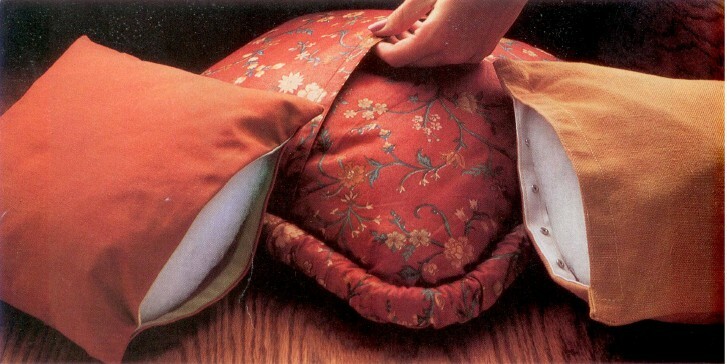 Overlap closures are placed in the center back of a pillow. Zippers hook and loop tape or snap tape can be inserted in the center back or side seam. Except for pillows with overlap closures, cut pillows allowing for 3/4″ (2 cm) seam allowances on closure seam. A simple overlap closure is a technique for pillow shams as well as an easy and inexpensive closure method for any pillow. 1) Cut pillow back 5-1/2′ (14 cm) wider than front to allow 3″ (7.5 cm) overlap. Cut back in half, cutting across widened dimension. 2) Press under 1/4 (6 mm), then 1″ (2.5 cm) for double-fold hem on each center edge of pillow back. Edgestitch or blindstitch the hems in place. 3) Pin pillow front to back with raw edges even and hemmed edges overlapping in center. Stitch 1/2′ (1.3 cm) seams. Turn right side out and insert pillow form or liner.